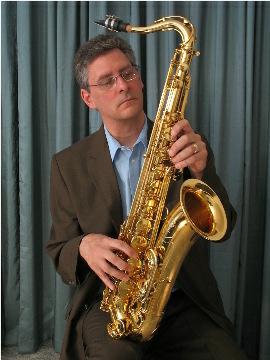 The tenor sax is the third voice in the saxophone family. It is pitched in Bb, and sounds M9 below written. This horn does a lot of grunt work in many ensembles. Only the first tenor in jazz ensembles carries lead lines. Otherwise, it is relegated to internal, harmonic parts. Which for players with good ears are neat parts in themselves. This is particularly true in my favorite type of ensemble: the sax quartet. Band teachers should only allow a student to switch to this voice from alto after their second or third year of playing. It takes more air, and intonation requires more control than the alto. But hey—John Coltrane, Stan Getz, Sonny Rollins—all tenor players. That’s gotta tell you something, right? In this pic, I’m holding my main axe: a 2001 Selmer model 84 (Reference 36). It is armed with a Rousseau 3R wrapped with a Bonade ligature. For less than 20 years prior, I blew on a Yamaha YTS-52 with a Meyer M.
I always wanted to be a tenor player. When I was a young kid of 8 or 9, I listened to an old Boots Randolph record my parents had until every note was in memory. Some think Randolph was kind of hokey, but he’s what put the hook in me at that age. 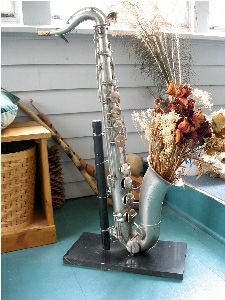 Here’s a pic of my 1893 antique sax. I picked it up in a flea market outside Brussels, Belgium. Notice it’s a bit smaller than modern horns. It only goes down to low B. Note the two octave levers. 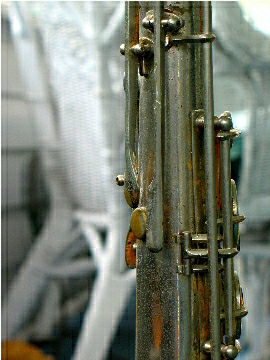 The D-G vent is on the left. The A and above octave lever is on the right. 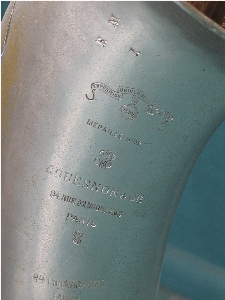 Above is a close up of the markings on the right side of the bell. No scroll work. Just some non-pretty inspection stamps.